Hey! Sorry for the stretch of silence on my end. It has been unusually cold in north Texas and I haven’t been wanting to get out in my shop and freeze. Buuut, I have been able to get some things done here and there when the sun decided to come out. 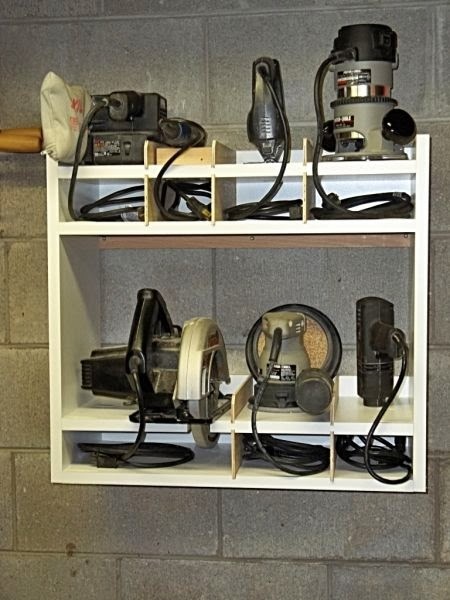 One thing I did was finally build a storage system for my corded power tools. I did a lot of looking around but decided that the french cleat system was the direction I wanted to go. 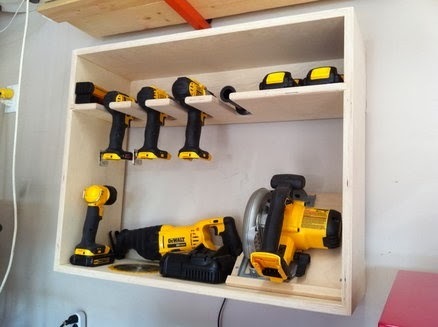 I was using a cabinet up to this point, but I’m not a huge fan of cabinet storage so when I first saw this thing called “french cleat system” in Family Handyman, I knew it was the exact thing I wanted to build to store my tools. It’s taken me a few months to get around to it….so many projects, so little time and all that….but now that it’s in, I can’t be more pleased. I love how visible and accessible it makes my tools, and how flexible the overall system is. If you aren’t familiar with the french cleat system it’s pretty much just a piece of wood attached to the wall with the top cut at a 45 degree angle. Then you make individual hangers with a ‘cleat’ on the back that is also cut at a 45 degree angle. Then you hang the cleat on the wall brace and use gravity to keep it there….brilliant but simple….my favorite thing (besides new tools and thin mints of course). Here are the steps in case you are interested in making your own. I had so many 1x pine scraps laying around that I decided to use them for this project. I drilled a pilot hole first on everything to keep my wood from splitting. Make sure to countersink all your screws so everything sits flush. 1) I found two boards that were 2′ long and ran them through my table saw with the blade tilted at 45 degrees to make the top beveled. 2) I first located the studs in my shop wall (related video here), then used 2″ screws to attach it in place. Then I repeated the steps and added a second brace 14″ down from the first. Note: When making your hangers, you need to make the back piece (that is connected to the cleat) long enough, to where it goes down at least to the bottom of the brace on the wall. If you don’t make it at least as long as the brace then it won’t sit as snugly when you hang it. 1) I first made the platform for my drills so I could get an idea on how wide it needed to be. I simply just rested my drill/impact on the piece then traced around it with a pencil. Tip: Make sure you remember the base of the drill is wider than the top where you are tracing. 2) Then I cut the back and the cleat then screwed them together. 3) Next, I used my jigsaw to cut out the two drill slots and used my Kreg pocket jig to make three pockets in the back. Then came up 1″ from the bottom and screwed it in place. 4) To give the base a little more support, I cut two wings to place on the each side. I made the base shallow so it wouldn’t be too hard to support, but this means that I can’t holster my drill with my drilling guide still in the chuck. Since this is what I primarily keep in my drill I decided to add on a magnet so I would be able to always keep it close and easily assessable. 2) Then cut it to size with my table saw, and cut the blade slot with my scroll saw. At first I made the blade slot 3/4″ wide, but then went back and made it an even inch. 4) I cut a back the same dimensions then attached it to a cleat. Since this is a heavy tool, I went ahead and made the cleat a little wider than the hanger so it has a larger footprint on the wall brace. 5) I also cut and attached a footer on this hanger since it actually hangs down past the wall brace. This keeps the hanger from angling in towards the wall at the bottom. 6) The next thing I did was cut the side pieces and to be honest, I have no idea how to figure out what angle was needed so I just cheated. I wanted the bases to be about 4 1/2″ apart from one another so I laid down a fresh scrap, then put the two platforms on their side and on top of it then moved them to the position I wanted them. Then I just made a few marks, moved off the front and back pieces, then used a straight edge to connect the marks which created the lines for my side triangles. 7) Then I was able to cut them out and attach them with screws. Tip: Again…pilot hole, pilot hole, pilot hole. 8) Since my tools are corded, I ransacked a spare hardware container in my shop and found four hooks that would work perfect so I took one and screwed it into the side. …but it would only take a slight bump for it to go backwards and fall off. So I picked up a few scraps from my floor and used a nail gun to make a simple latch to keep it steady. If you do not want to worry about the latch, you can either increase the angle of the sides, or make a flat platform. 1) I cut the back and attached it to a cleat. 2) Then I cut the base, drilled three pockets, then mounted it 1″ from the bottom. 3) Last thing was to screw a hook onto the side to hold the cord. I was originally going to make the slot forward facing just like my drills, but decided that the weight of the router rested better when I turned the slot sideways. 1) I measured my router and made the below layout. 2) Once I cut it out and decided to rotate it, I cut the ‘arms’ of the base off a little shorter. Then cut a back and attached it to a cleat. 3) Again, to make the side I cheated and held the hanger on it’s side against a scrap piece then first traced the base, then moved it, and used a straight edge to connect the top left corner to the end of my line to make a triangle then I just cut it out. 4) Last thing was to screw on the side and the hook for the cord. So I guess I got carried away because I don’t have a single photo of this in pieces…. : ) oops. 1) It’s the same exact steps though….I cut the back and attached it to a cleat. 2) Then I cut the base and drilled pockets then attached it 1″ from the bottom. 3) To keep the charger from moving, I cut two stripes 5/8″ wide and glued them on each side. Note: You can either drill a hole in the base for the cord, or you can leave a gap on one of your side pieces. Yeah yeah I know…but I haven’t been able to upgrade to a Mikita jigsaw yet. 2) Then measured and cut the peg piece. Put a couple pockets in the back then screwed it in place. I did not add a hook for this cord, because of the position of the peg, I’m able to wrap the cord loosely then slide the saw on the peg and the cord be sandwiched in place. Same steps as the Jigsaw. Same thing again, expect since I added a hook for the cord. 2) Then I cut two pegs. One to create a lip for the tool to rest on, and the other to counter the tool from swinging forward. I mounted the first flush with the left side, but move the bottom peg in just a little so the tool isn’t resting completely up and down. Edit: Last weekend I got around to painting my system my shop colors so here is an updated photo. 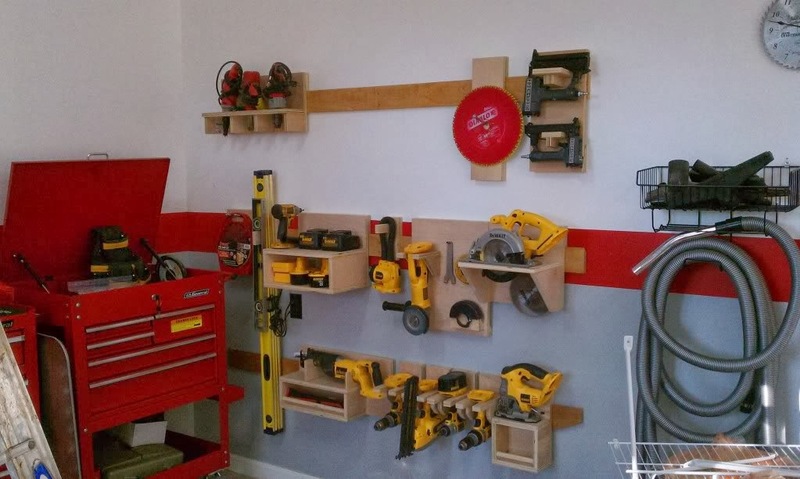 If you are looking for alternatives to store your tools, here is a small collection of photos that caught my eye when I was debating on how I was going to handle mine. Good job and really looks the business too. Thanks for sharing.